There is already a New Censorship afoot, Google has block the Alex Jones Channel Youtube home page from all search results. ‘TheAlexJonesChannel’ (http://www.youtube.com/user/TheAlexJonesChannel) used to come up under in the top 5 search results with the simple search of ‘alex jones’ in Google. Now even a search of ‘TheAlexJonesChannel’ or ‘alex jones youtube channel’ do not return a listing for the Alex Jones Youtube Channel homepage. This is like searching for ‘National Public Radio NPR’ or ‘Fox Business Channel FBC’ and not getting there homepage only websites produced by the individual reporters. This is a Targeted Google Search Kill Switch, to silence key voices of ideas at specific crucial times. We all need to get out and talk face to face with family, friends and neighbours. Have a neighbourhood grill-out with free hotdogs, get a bell and fliers, get a soapbox. We must create and establish, simple open lines of communication against the loss of liberty and justice, before the big kill switch is thrown and we don’t have the internet or cell phones. It is a total kill switch, a media blackout, a deliberate attack. The only return that is coming up are the actual Youtube video results produced and posted by TheAlexJonesChannel. 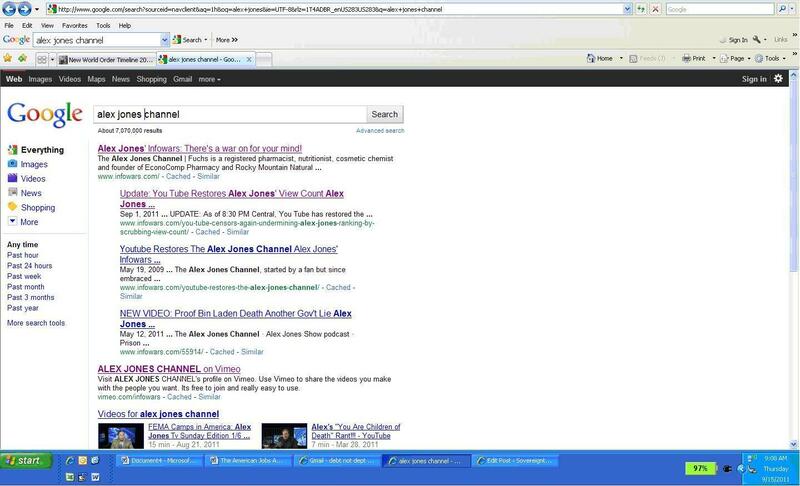 The old link that was to the TheAlexJonesChannel homepage has been completely blacklisted from search results on Google. Time to admit to doing evil Google and that you are fighting the wrong side of this information war with violations of civil liberty, threat fusion collusion and even simple equity with regard to the access of the public domain. Silence opposition, ends justify the means, RAND corp. game theory, central control and power, to make a profit. This should be the Google creed, as it is for every other multinational Corp-erson. 6. DHS HITS US with NSTIC! HIDE, HIDE!! 21. DARPA, the CIA, FBI, NSA, HLS, CPS, ATF, ICE, Private Corporate Spies and Open Access to Your Email What Could Go Wrong? Thanks for the easy to use email addresses, etc. I have tested several sites. Objections to the censorship must have worked. I was able to get through on the sites I tried and youtube, it did come up first when I tried about 9:40 p.m. MSvT. infowars comes up in the search resutls but not their youtube channel.